Wildland fire management has reached a crossroads. Current perspectives are not capable of answering interdisciplinary adaptation and mitigation challenges posed by increases in wildfire risk to human populations and the need to reintegrate fire as a vital landscape process. Fire science has been, and continues to be, performed in isolated "silos," including institutions (e.g., agencies versus universities), organizational structures (e.g., federal agency mandates versus local and state procedures for responding to fire), and research foci (e.g., physical science, natural science, and social science). These silos tend to promote research, management, and policy that focus only on targeted aspects of the "wicked" wildfire problem. 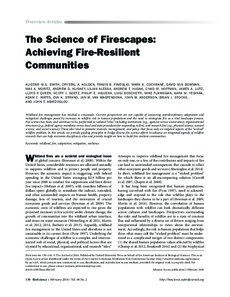 In this article, we provide guiding principles to bridge diverse fire science efforts to advance an integrated agenda of wildfire research that can help overcome disciplinary silos and provide insight on how to build fire-resilient communities.